The elk (älg) is very iconic here in the north of Sweden. I charted my own design using traditional motifs. I added simple border patterns that were easy to repeat over a multiple of 5 stitches. Been a while since I did stranded knitting. Using cotton makes even knitting extra difficult. I probably have made my stranding rather tight this time. Out of practise or focus? 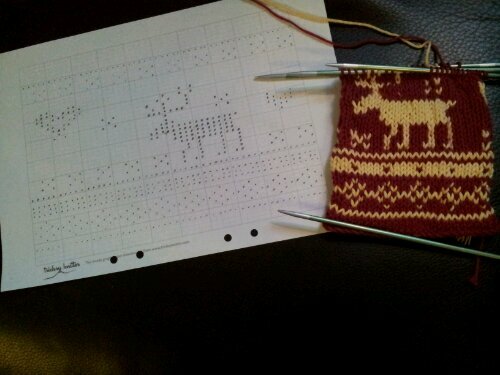 Still, it is taking shape… 😉 PS I owe much to the inspiring book by Sheila MaGregor: “Traditional Scandinavian Knitting” which contains countless invaluable charts and fascinating history. Thanks for the tip about the bok too. The book by Sheila McGregor is well worth getting. I bought it online from Amazon.